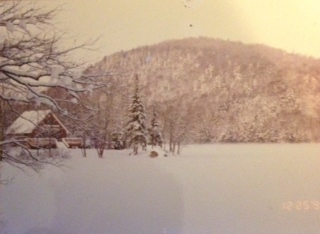 Moving to the Adirondacks in 1989 was a delight though it was minus 19 degrees the day I drove down the drive way to our home in Higgins Bay. 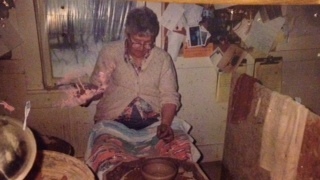 That winter my pottery equipment was stored in the barn while I curled up in front of the fire and read clay book after clay book. My mind was full of pots as I cross country skied, snowmobiled and walked our dog Willie. 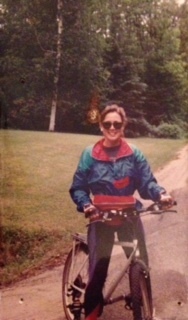 Spring 1990 saw me setting up in one of the cabins on Piseco Lake. The trek down the steep hill to the clay cabin was fine and the view was spectacular. 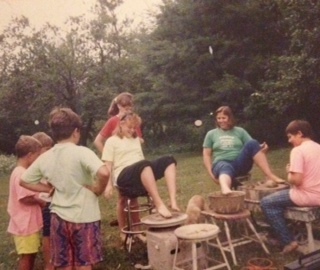 That summer was filled with making pots, swimming, sailing and bike rides around Piseco Lake. I knew this studio was a temporary respite that would last only through the summer because the set-up was difficult and firing was almost impossible. Four months (May, June, July & August) at the tiny Pisceo Lake studio refreshed my clay life. September 1990 was moving time again. 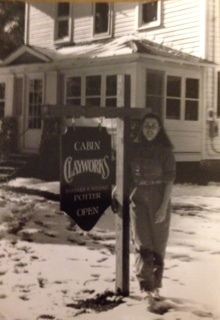 I’d rented a house in Speculator to use as my studio and named her Cabin Clayworks. I used the name Cabin Clayworks because I wanted to remember the four magical months in Piseco and use that time as inspiration for my new clay studio. 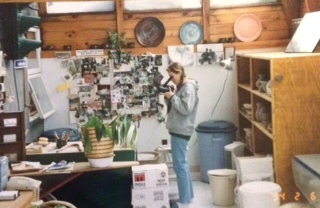 This studio would be a clay teaching and retail pottery shop. 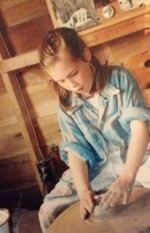 This was when I sat myself down and figured out finances for supporting myself through clay work. Twenty-one students ~ that was the number of weekly pottery students I would need to keep myself afloat at Cabin Clayworks. The first floor and basement were turned into a pottery studio with the upstairs being an apartment. It wasn’t a perfect studio or perfect apartment arrangement as the kitchen was my glazing room (!) and the only bathroom for studio/customers and the apartment was upstairs in the apartment. What a fun time, great students, quirky living arrangement and fantastic customers!! 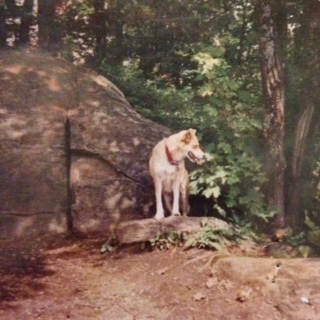 Frannie (my new pup) was always playing or curled up sleeping nearby. 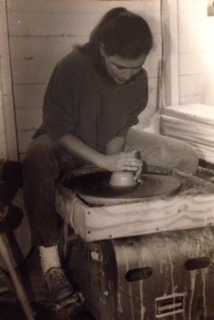 This was the time of throwing cream cheese on the wheel and eating the bowls we made with crackers (yes, I meticulously cleaned my wheel and tools before my students and I made those bowls! ), Open Houses with fruit bowls and cheese plates made by myself and students, outdoor foot throwing contests, custom orders made with love and weekly Scrabble games between pottery lessons. 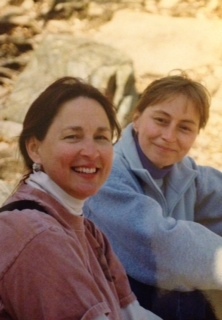 Great memories, emotional times, friends I miss. 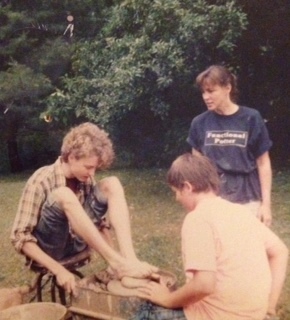 Another move in 1991 to Oxbow Lake and the tiny outdoor and then incredible indoor pottery studios. This move was emotional, filled with love & caring. 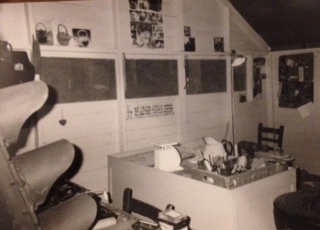 The first Oxbow studio was set up in a small outdoor shed and was quaint but only suited to middle of summer potting. I cut back on students and just taught a few friends’ children. 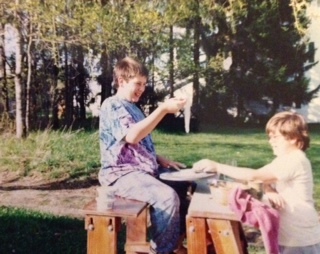 It was the time of starting my classes with us sitting by the edge of Oxbow lake with our eyes closed making small pinch pots. We’d walk up to the studio and throw a few pots. Very laid back, very quiet but filled with smiles and quiet conversation. 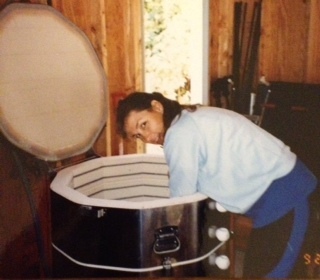 Once the weather began to turn that year we had the indoor pool filled in, a floor put down and my pottery studio was moved indoors. I had windows everywhere with a vaulted ceiling of glass. Again, I cut back students and concentrated on making pots for myself. It was quite a wonderful time with the lake a few steps away. Frannie and I swam, skied and skated on Oxbow Lake. 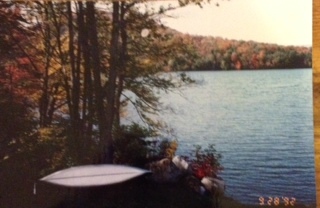 I’d canoe across the lake and sit on my favorite rock and draw sketches of future pots. My clay life was open and I ran with the freedom to create. These are the good memories . . .